Hugh Beach crept closer to the bridge, armed with a sten-gun. He had been sent forward alone to check that the bridge was safe for tanks and other vehicles to cross. As he silently approached, two figures came into view and he recognised the grey uniform – German. Instead of retreating to safety and reporting the danger, he crept ever closer, raised his weapon and opened fire. The courageous solo assault left the lieutenant severely wounded from enemy fire, temporarily paralysed from the waist down. At the age of just 21 he was awarded the Military Cross for his bravery. 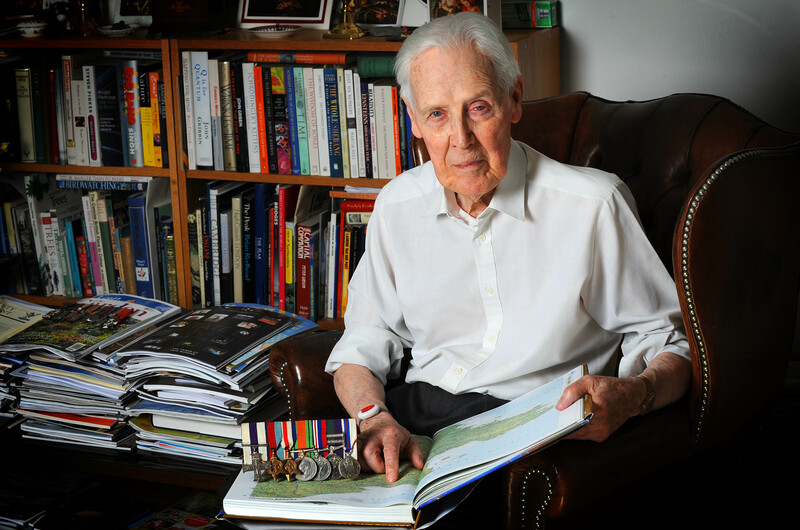 Now, aged 89, after 40 years in the Armed Forces and having been knighted twice by the Queen, General Sir Hugh Beach GBE KCB MC, has made a Lottery-funded trip coinciding with D-Day to visit the areas he served during the war, including the spot he made his single-handed attack. Sir Hugh, from Earl’s Court, London, is just one of a number of Second World War veterans who have made poignant commemorative visits as part of the Big Lottery Fund’s Heroes Return programme. Sir Hugh Beach, who joined the Army in 1941 as a sapper, landed in France six days after D-Day. A lieutenant in 621 Field Squadron 7th Armoured Division, he was first tasked with finding his unit to deliver a three-tonne lorry full of supplies. After finding his unit, Sir Hugh was billeted at a farm at St Paul du Vernay for six weeks. It was at the village of La Vallee on 8 August 1944 when Sir Hugh first demonstrated the kind of courage that later earned him a Military Cross. He was attached to an infantry division which had fought and driven away German soldiers. He recalled: “We suspected the Germans would have left landmines behind. We needed to get some anti-tank guns into position in case the Germans counter-attacked, which they did later. So we had to clear the road of landmines from the village to some crossroads. “About six of us using mine detectors then cleared the road. But the first vehicle to leave the village was blown up – we missed that mine. This threw the plans up into the air – no-one wanted to move, understandably. I then decided to do something that was, in hindsight, absolutely crazy. It was at La Bassee in northern France near the Belgian border, while Sir Hugh was attached to the 11th Hussars, that he came within millimetres of being paralysed from the waist down. “We approached a bridge and knew that the Germans had tried to demolish it,” he said. “I was asked to take a look at it and see if it was safe to take tanks and vehicles across. I drove towards it and about 200 yards to the side of the bridge and parked my scout-car behind a hut. I approached, carrying a sten-gun. “The railways line was about 100 yards away and the bridge seemed okay – although really I wasn’t close enough to make a proper assessment. Then I saw grey figures across the bank and realised they were German soldiers. This was my first chance to engage the enemy. I opened fire and after two rounds the gun jammed. I dropped down and they returned fire. His comrades tried to find a field ambulance but as it was getting dark they saw a building which had a door and a red cross painted on it. Sir Hugh was awarded the Military Cross but the wound marked the end of the war for him and he was flown back to Britain to undergo further treatment on his spine. Following his recovery, the next year he served in India, Ceylon and then saw active service in Java during the Allied mission to liberate the Dutch held by the Japanese in jungle internment camps. The Indonesians believed the real goal was the restoration of Dutch rule and a bloody insurgency was sparked. 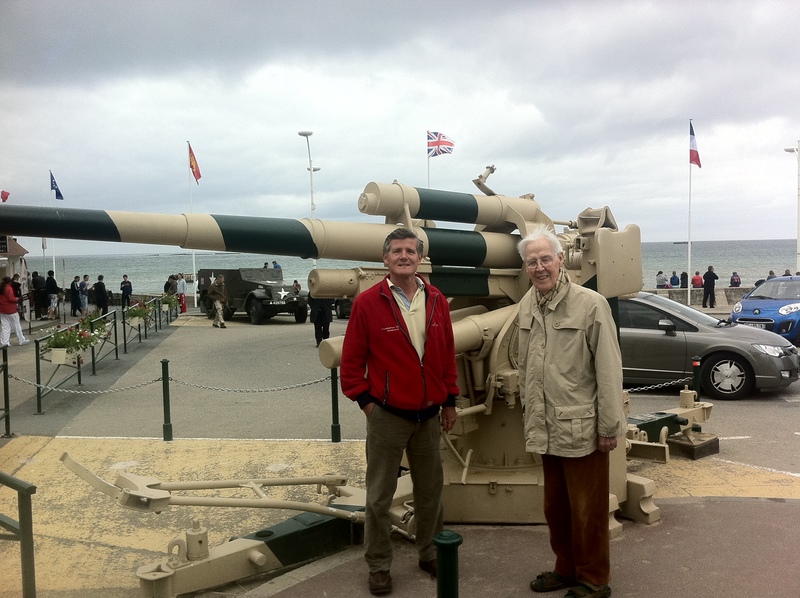 Sir Hugh was accompanied on his Heroes Return trip to France by his son Michael, who served with the Royal Green Jackets between 1977 and 1980, and grandson William.